One of the main reasons why my company does not offer SEO services is not being able to 100% deliver on what the client hires you for. I'd say 99% of those seeking SEO services are looking to rank well for a handful of keywords. They want to see their web pages in the number one, two or three position of the organic listings for keywords like [diamond rings]. It can be done but in a second, after the result is released, Google can push out an update or hit the site with a penalty and the result is gone and what you delivered has also vanished. Personally, I do not understand how SEO companies deal with the blame game. I know, SEO companies don't sell rankings and many won't guarantee them. But when the customer comes with the initial intention of ranking for specific keywords and ultimately, one day, you can't deliver - how would that make you feel? A Google Webmaster Help thread has one SEO company seemingly upset that his client is blaming him for the site not ranking well anymore. The blame is specific to a client pointing out he is linking to his site with a banner ad and not using a nofollow. I honestly doubt a single link that is not nofollowed would lead to this issue. So it is something else that resulted in the downgrade of the site's ranking. That being said, the SEO company is clearly upset and I am sure the SEO client is also upset. Tell me, most of you who read this site are SEO companies or do SEO each day. 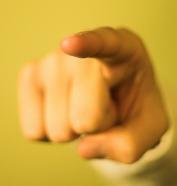 How do you deal with the blame game and finger pointing?